Inbound Marketing – What is it and how to work with it? Content Marketing – What is it and how to work with it? Nowadays, lead generation is one of the most sought-after services, either by professionals and companies. What used to be called prospects or contacts, today is called leads. The goal and the end result are the same, though: to convert a contact into a sale. Lead generation was born of an obvious need to speed up the capture of contacts and then later convert them through digital or non-digital actions. In the past, it was usual to make telemarketing through telephone directories, in a totally random manner and without any type of segmentation, whereas today it is possible not only to work with segmentation, but also to nourish the contact through omnichannel or multichannel digital marketing strategies. There are several ways to work with lead capture and/or lead generation on the internet. Naturally, there are differences in lead generation strategies for B2C (Business to Client) and B2B (Business to Business) type of businesses. When you are selling a product to an end customer, communication, and even the means of capturing leads, differ from when you are selling a product to a company. Different communication. Different approaches. Different results. Over the last few years, I have been improving my digital marketing work around lead generation. Besides being an extremely challenging job, it is also a really demanding job in terms of creativity. Considering the amount of stimuli and information running on the internet on a daily basis, capturing the audience’s attention and getting them fill in a form, for example, can be an extremely challenging work in every aspect. During the last 4 years of work at the digital marketing agency I have built with my wife, I was able to handle accounts from tens of different clients and businesses, of all sizes and for all tastes. Of course that situation is an interesting challenge, since working with different businesses allows us to gain different knowledge of what digital marketing is and how it works. In digital or non-digital marketings, there are no certainties or magic formulas. Everything needs testing: testing is almost always the answer to everything. From the experience gained, I quickly realized that B2C businesses can easily generate more leads in relaxed environments such as social networking, while B2B type of businesses need a different approach, often rooted in Google AdWords campaigns..
As its definition suggests, inbound marketing consists of the production of content, including blog articles, podcasts, videos, e-books, newsletters, etc. 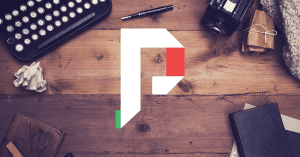 Any form of content production that is used as a way to attract the potential client to leave their contact on a particular page or simply get them to take that action. Although inbound marketing assumes very long-term results, it is an extremely viable form of lead generation. Those four steps are essential to a good inbound marketing strategy, regardless of how long each one involves. 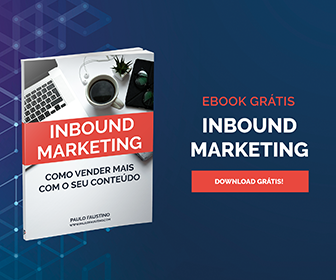 Inbound marketing as a lead generation strategy is possible, but it assumes a regular production of content, in order to create long term results. What is the purpose of the content to be created? What product do you intend to sell? What do your clients want to buy? What content do you need for your brand in every step of the sales process? How to measure the results? All of the above mentioned items are essential to an inbound marketing strategy in order to generate long-term leads. In addition, it is crucial to have a publishing calendar for content production, which will act as a way of controlling the pieces of content to be created, the objective of each piece of content, the means of distributing it and the control of results through web analytics and other data measurement tools, which allow us to ensure that the campaign is profitable and/or is meeting its intended purpose. One of the fastest ways to get leads is through Facebook Marketing. There are several strategies and approaches to get leads through Facebook ads that, with a goal-oriented investment, enable us to create the desired results in a fraction of the time we need. In fact, ads on Facebook are the best way to reduce the time to reach that goal. If we imagine that in an inbound marketing strategy we would need 6 months to get started to create stable and compelling results, through Facebook ads we have been able to reduce the time to roughly 1 month or less. The only point is that we have to constantly invest money to generate the expected results. The capture of leads using Facebook works extremely well, and the practical results of the leads conversion into sales also works as well. A business is unlike the other, and every product is different from the other products. There are business areas where it is easy to get leads for extremely low prices, while in others prices are slightly higher. When we are talking about B2C, regardless of the type of business, getting leads via Facebook is essential to achieve the proposed result as soon as possible. Concretely, when talking about Facebook, there are two ways to work with lead generation: on-page and off-page. This means that we can capture the lead within Facebook itself through lead generation ads, or we can capture them using Facebook ads to get people to a landing page where we convert them into leads. Both strategies are possible, but with some slight differences. Facebook offers a wide range of types of ads according to the marketing goals of each company or person. Depending on the goal we want to achieve, we may choose different approaches when working with Facebook ads. Each of those approaches represents a distinct communication, a different ad format, and, of course, different results. 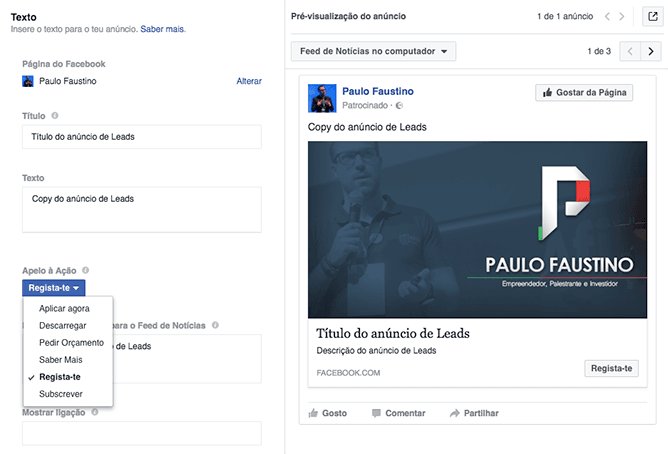 Considering the generation of leads on-site on Facebook, the option “Leads Generation” should be chosen in the ads panel. 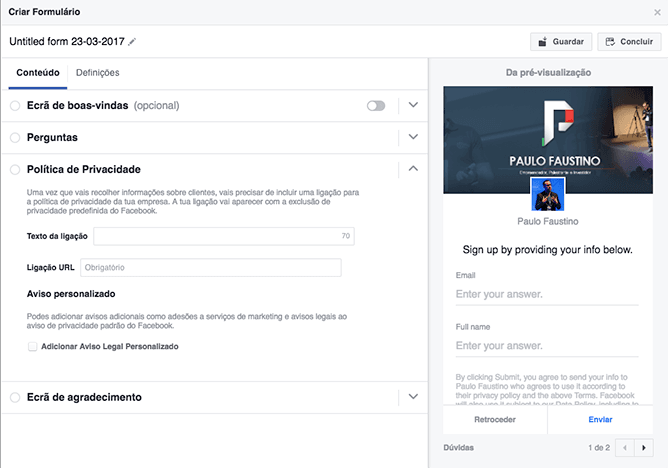 This type of ad allows us to capture contacts directly from the Facebook platform, without the potential client needing to leave Facebook to fill in a form and then generate a lead. 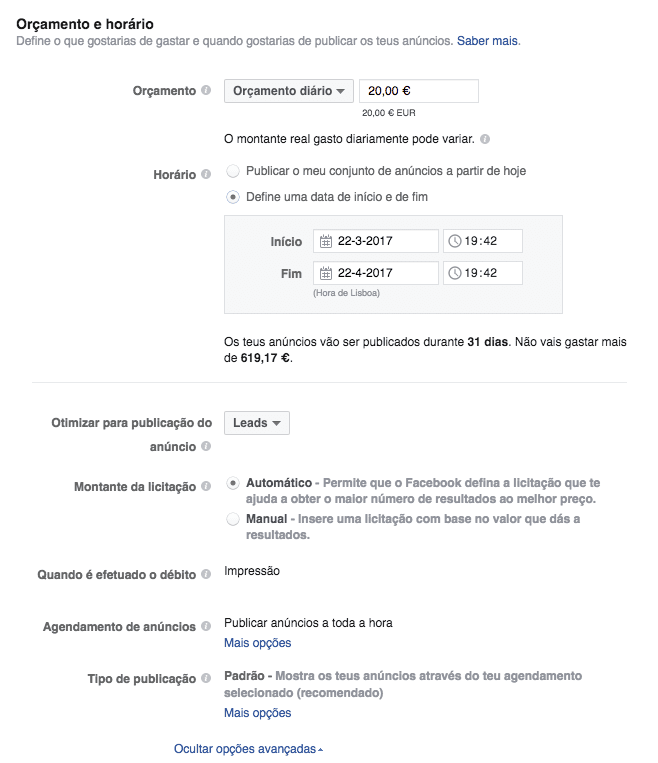 In the next step we need to choose the Facebook page that will do the lead generation and accept the Terms for Facebook Leads Ads. Goal: Women who take care of and/or care about the condition of their skin. Women who like beauty products. Job Status: Working women with medium or high income. Although our goal is lead generation, it is essential to know in advance the person who will buy these same products. There are products clearly consumed by women, products mostly consumed by men and unisex products or that have consistent sales for both genders. Regardless, the product will always have a target person. To build your persona you can use one of several tools available on the internet for this purpose, such as the website www.makemypersona.com of Hubspot, for example, which in addition to helping in the creation of the persona, serves as a tool for capturing leads. 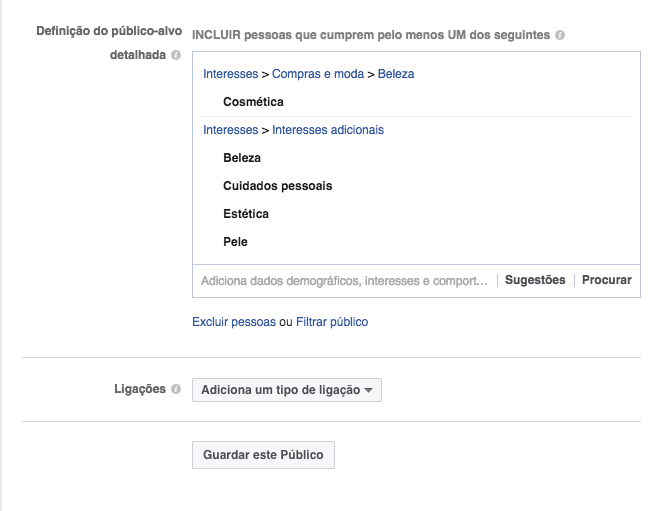 In the next step, it is essential to target the audience based on their interests or activities on Facebook. While sometimes the interests may not necessarily match a person’s specific interest in that topic, segmentation helps us find a narrower and potentially more interesting audience for the campaign we want to develop. Segmentation is always crucial as a way to avoid working with a public that is too broad or too large in order to make the process or its results totally not possible to happen. The places where the ads are going to be shown are equally important. Although lead generation ads are not available all around Facebook ad distribution channels, certainly there are times when targeting these channels will be important to you. Lead generation ads only appear on Facebook and Instagram feeds, desktop and mobile. The budget and timing of your campaign are equally important. If we use a budget for the entire campaign, we have the possibility to choose at what times the ad will be shown. If we set a campaign start and end dates, unfortunately we cannot choose the campaign distribution times. Choose a total amount or a daily amount for your campaign, keep your ads optimized for the leads goal and automatic bidding. This way the Facebook algorithm will manage the budget automatically and distribute the campaign in the most optimized way, ensuring the best possible result. Ad Image: Images for ads like these should be uploaded with the size of 1200 x 628 pixels and less than 20% of text in the image. That way we guarantee the best possible distribution rate for the campaign. However, the image should be extremely appealing. Tip: Never use the Facebook blue color as it does not stand out in the news feed. Ad Title: It’s one of the most important calls of all. It has to be catchy and short enough. Ad Copy: Copy is also one of the most important calls of an ad on Facebook. It should be short enough so it is not necessary to click on “Read More”, concise, to the point and able to encourage the immediate interest of the consumer. Ad Description: The description is shown right below the ad title, but is probably the least important aspect of the campaign. The vast majority of consumers do not read the ad description. Clients tend to read copy, image, and title. Call-to-action: The button for action itself, which is also something to be set. Unfortunately we are forced to select one of the options that Facebook gives us, but they are still enough for the vast majority of cases. Avoid choosing the “Learn More” button, as they do not call for direct action like the “Buy Now” or “Ask for a Budget” buttons, for example. Right below is the indication that we need to create a lead form. 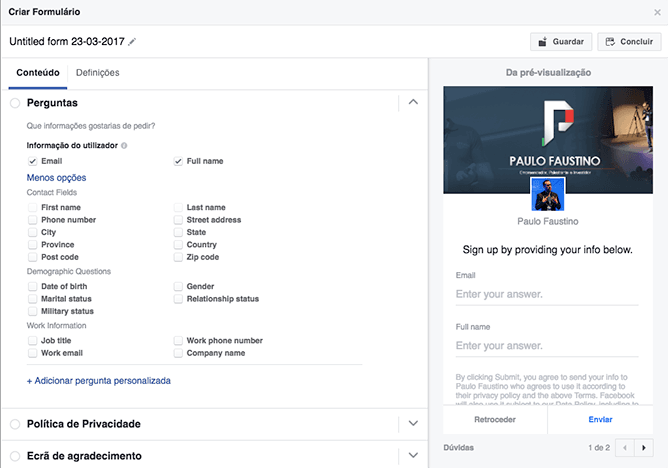 It is in this step that we define the contact capture form within Facebook and what information we want to capture with our lead capture ad. 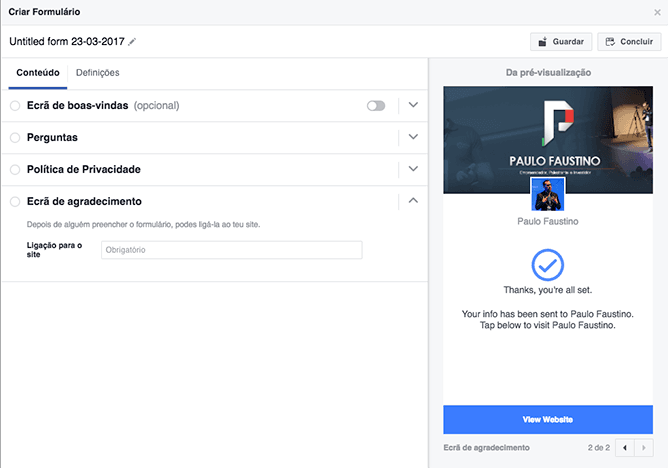 In this first step of creating the lead capture form on Facebook, it is suggested that we first create the “Welcome Screen”. I suggest disabling this option because it makes the user to take an extra step into conversion. This means that if the user clicks on the campaign, they will first see a welcome screen and only after clicking forward they will see the form. An extra step in a lead capture ad can represent a substantial decrease in conversion. In the next step, we have what Facebook calls “Questions”, which are in fact the fields of our lead generation form. 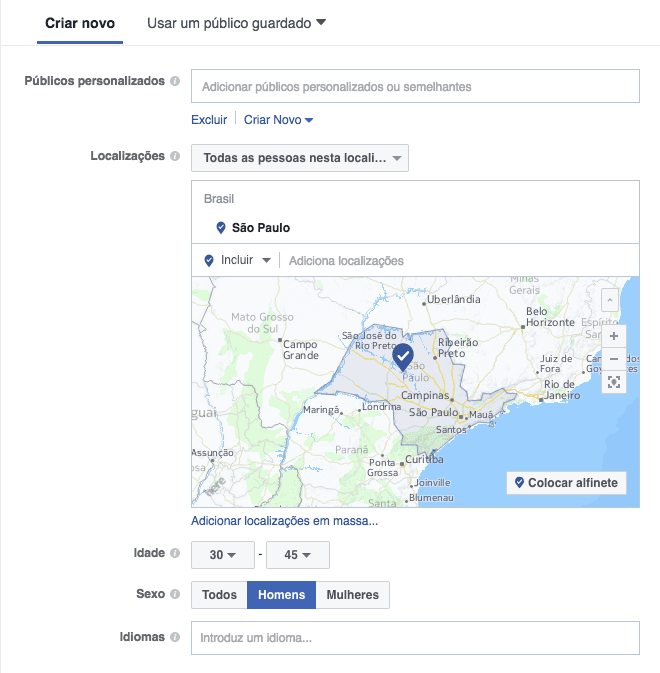 In this section we have the possibility to choose parameters of information that Facebook itself collects internally, such as people names, email addresses, locations, dates of birth, age, etc. 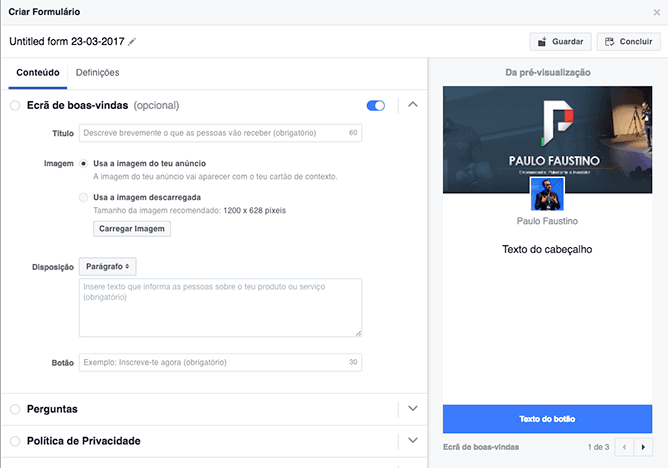 All the main Facebook profile fields are represented here, and those data are going to be automatically populated, unless the user does not have that information uploaded to their Facebook account. There is also the possibility to click on the option “+ Add a personalized question” where we can create specific fields according to the type of lead generation campaign we are doing or to simply meet the needs of the same campaign. Finally, we have the “thank you” screen, where we can leave a link to our website. This page will appear to the users after they submit the leads form and is a great way to, in addition to capturing the lead, send the user off Facebook as a way to make him visit a particular website or content. 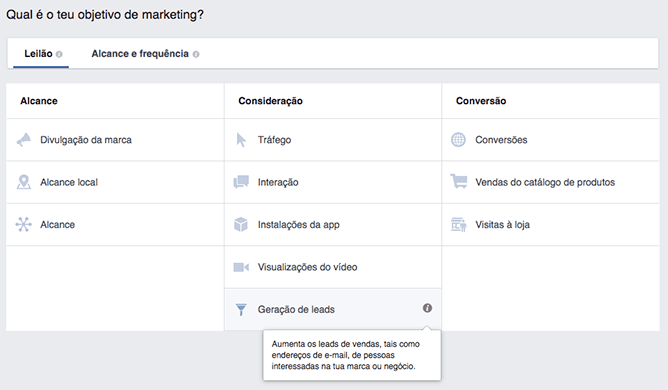 I should also highlight the “Settings” tab, where you can define the language of the form (Portuguese from Portugal and Brazil are available) and field identification, which can be extremely useful for importing leads into CRM or Email Marketing softwares, with immediate correspondence of the fields. One of the latest news from Facebook was the launch of lead generation ads on Instagram. In the past, this ad format was only available on Facebook. From now on, it is also possible to use the lead generation format on Instagram. Naturally, Instagram audience is different from the Facebook audience. As a platform, Instagram itself is different and extremely appealing to the areas of fashion, hospitality, catering, lifestyle, etc. As it is a social network based on photography, the image counts and makes all the difference in the final result. 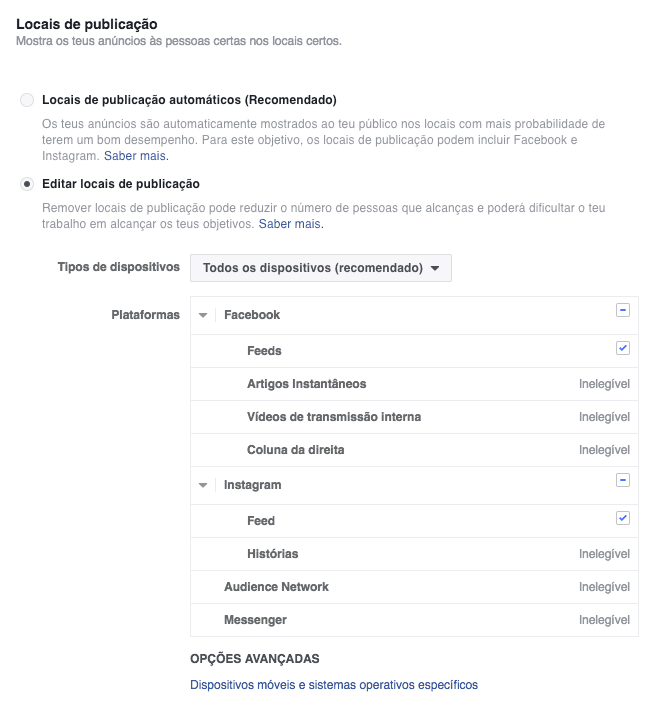 When we get to the publish locations option while making lead ads on Facebook, we can turn Facebook off and run the ads exclusively on Instagram. The ideal would be to make a campaign for Facebook and another campaign exclusively for Instagram to perceive the behavior of the public in each one of the platforms and to compare the data. Now, Instagram has over 450 million active users worldwide. In certain business areas, lead generation on Instagram makes perfect sense. The public is very active, quite young and with well-defined interests. The cost of getting leads at this point is also lower than with Facebook. Another strategy, and probably the most used by marketers, is the generation of leads with landing pages. This strategy basically consists of capturing the contacts within a landing page with specific characteristics. 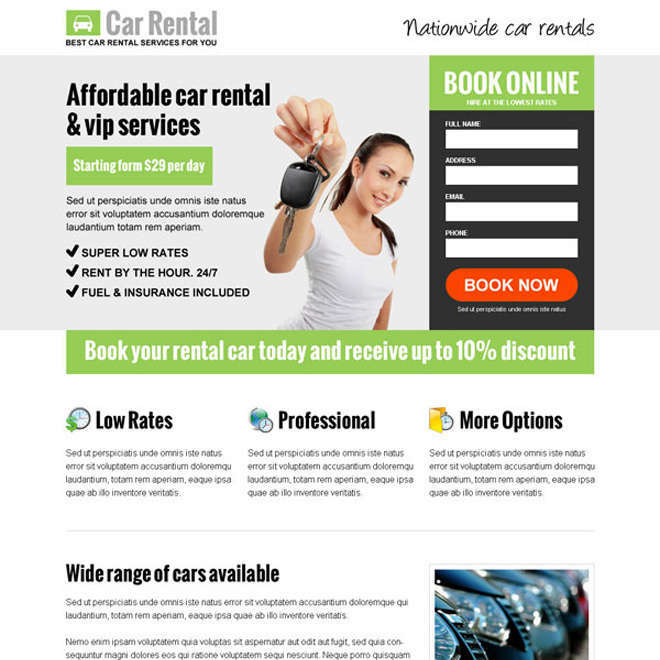 In such a situation, it would be necessary to create the landing page and then send the traffic to that very page. Facebook ads play a big role in this strategy, but instead of letting Facebook capture the leads, we simply buy the traffic and do the conversion off of Facebook. One of the platforms I like to use when creating landing pages is the Unbounce platform. Although not a cheap tool, it allows you to easily create effective landing pages without the need to design and program each one. In addition to saving us a lot of time in creating landing pages, Unbounce still allows us to do some interesting things like A/B tests between pages, direct integration with email marketing softwares, and more. 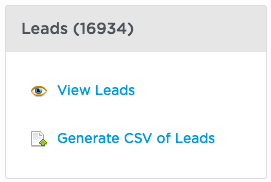 One of the most interesting things about Unbounce is that in addition to capturing the data, it allows you to view and generate CSV files with the leads. It also allows us to define a basic communication integration, in which whenever a lead is captured, an email is automatically triggered with the lead data. This is a really interesting tool for anyone who works with leads in a fast way. When generating a lead, the longer it takes us to contact them, the less likely we are to convert them into a sale. In lead generation, one of the most important aspects is timing. The faster you initiate contact with that potential customer, the more likely you are to convert it into a sale. Unbounce has several integrations that allow us to speed up this communication process, especially when there are different departments working with the same Lead. If we imagine that lead generation is managed by the marketing department, but subsequent contact with the Lead is done by the communication department or telemarketing, then communication timing is critical to the end result of the campaign. 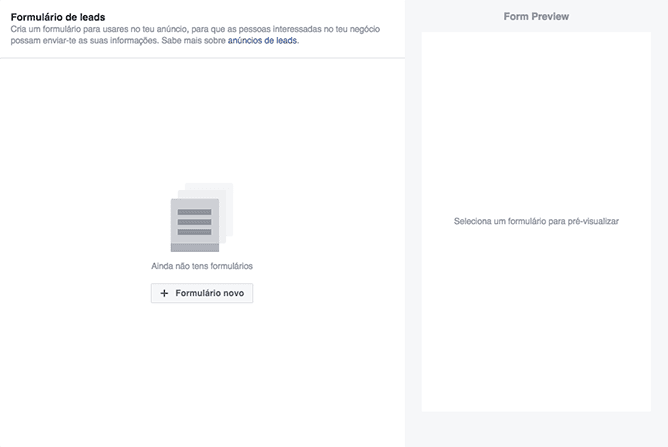 Form above the fold – The contact generation form must be above the fold, which means that the user does not need to scroll to view and fill in the form. No exit point – A landing page should not contain a single link that allows the user to leave the page. It can only have two paths when entering a landing page: close the window or fill in the form. Strong call-to-action – Call-to-action should be as appealing as possible. And in fact, call-to-action should clearly state what you want the user to do, for example: “Sign up and receive a free sample now!” or “I want a 1-hour free consultation”. You should never use vague call-to-actions such as “Learn More” or “Subscribe” because they really take the user away from the desired action and the conversion on the page will be much lower. 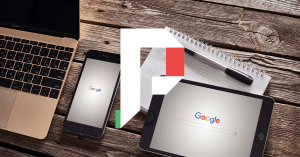 Appealing and responsive design – Today we think of “mobile first”, meaning the user will probably enter the landing page on a mobile device first. The landing page should also be thought of on mobile first, and then on the desktop. Video credibility – Using a video to talk about the product/service helps to make the offer credible. Videos tend to be more persuasive and, at the same time, help convert. Of course that a good design is helpful, page content too, etc. The more appealing the information is, the better. In this way we must guarantee that the user does not have doubts about the proposed offer; so they feel comfortable filling in the form with their personal data. In lead generation, one of the most important things is to offer something in return for capturing the data. As we are talking about personal data, as a rule the offer must be appealing enough for the user to feel tempted to give their personal data in exchange for the offer in question. We often call this a “digital bait” or “inbound product”, where something is offered in exchange for subscribing their data, or we sell an input product for a low price and later we do an up-sell for a higher value product. The more appealing the offer, the greater the likelihood of a high conversion rate. In the generation of leads the offer is essential to encourage interest in the user and capture their attention. Putting that on top of a good ad and a visually appealing landing page, we have everything to achieve excellent results in the generation of leads in B2C businesses. Affiliate Programs – How to Make Money with them? © Copyright 2019. 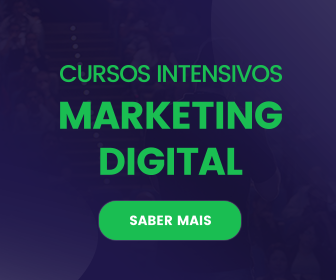 Paulo Faustino - Marketing Digital. All rights reserved. Created by Get Digital. 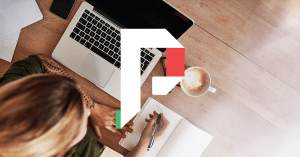 Get regular updates by email, tips and strategies about digital marketing, entrepreneurship, interviews and other stories, for free in your email. Stay calm! Your email will never be used by third parties or to spam.